The Finetta-Werk in Goslar, Harz (Germany) had been founded by Peter (Piet) Sarabèr, a Dutch native, born in 1899 in Delft. He was an electrician, a radio-constructor and hobby-photographer and studied engineering. He married 1924 a German woman and had three children. In 1940 he moved to Germany, where he opened a company in 1945 as an engineering consultant with focus on electricity. Beside the company's focus it developed cameras. In 1947 a cooperation with Helmut Finke began. Finke was a former constructor at Voigtländer, Braunschweig. 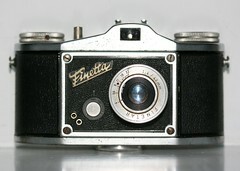 By 1948 they had developed the Finette 35mm viewfinder cameras, which were launched in 1949. Some cameras, such as the Finetta 88 carry the company name 'Saraber | Goslar" on the body, but are marked 'Finetta Werke' on the inside. 1. Finette I A: 43mm meniscus lens, fixfocus, one aperture, 1/30 sec. In 1951 Rudolf Trentsch, former camera constructor at Korelle, Dresden, camera constructor Karl-Heinz Reich from REKA-Kamera, Jena, and camera constructor H. Höhlemann entered the Finetta-Werk. In 1952 the camera developments reached a peak with the Finetta 99, with clockwork wind-on, fast focal plane shutter, bayonet mount, hot shoe, and 3 new lenses (45mm, 70mm, and 105mm). 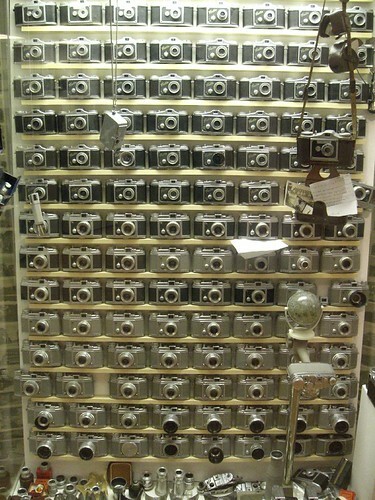 In the U.S. the camera was sold as Ditto 99. In 1953, camera production reached industrial dimensions. The Finetta Super was replaced by the Finetta 88, with a new bayonet and the body of the Finetta 99. Three lenses were available: Finetar 4/43, Finetar 2.8/45, and Finetar 6.3/70. In 1954 the company began a cooperation with Jacques Bogopolsky alias Jacques Bolsey which resulted in the exciting subminiature 8mm cine-film camera, the Bolsey 8. In 1956 the company went into insolvency. The factory was closed in 1957.